Beginning February 1, 2016, the west parking lot for Glenwood Hot Springs Pool will be closed to the general public. The Glenwood Hot Springs is committed to making every guest’s visit fantastic, especially during the new Grand Avenue bridge project. There will be a number of parking options for guests, and all of them are FREE. Download this printable parking map, or visit the website for more information. Glenwood Hot Springs is closed occasionally for maintenance. Please check for current hours of operation. Admission fees are variable depending on age, time of day and season. Pay admission once and come and go all day at no charge. Coolers are acceptable, but please no glass containers or alcohol. Swimsuit and towel rentals are available. There are men’s and women’s locker rooms with showers and coin operated lockers. Family changing rooms are also available. Umbrellas and shade tents are not permitted, however, ample shade is available throughout the property. Cabanas are available for rent, however reservations are recommended. Glenwood Hot Springs Pool, the Glenwood Hot Springs Resort and the Spa of the Rockies are wheelchair accessible. A hydraulic lift is available to help patrons with disabilities enter and exit the main pool. Swimming, soaking, playing and splashing in the Glenwood Hot Springs Pool is an iconic Glenwood Springs experience any time of year. The “big” pool, as it’s referred to, contains over 1 million gallons of water and is an aquatic playing field for kids of all ages. There is plenty of room to spread out and play catch or relax on an inflatable. There is even a lap lane and diving area. The Therapy Pool is Glenwood Hot Springs’ version of a hot tub. At 100 feet X 40 feet, it’s significantly smaller than the big pool, but still massive in scale compared to any hot tub. Its size and hotter temperature make it the perfect place for splash-free soaking. The Therapy Pool is also outfitted with bubble chairs and submerged benches that offer visitors still more ways to relax. During the warm weather months, Glenwood Hot Springs Pool operates two water slides. The Shoshone Chute is a body slide, while riders on the Avalanche Falls slide use inner tubes for their descent. Both slides feature a 47-foot drop which deposits riders into a separate pool overseen by lifeguards. For those looking for a break from the summer heat, pull up a lounge chair under one of the property’s giant poplar trees or relax beneath the newly built shade pergolas. A restaurant with indoor and outdoor seating serves breakfast and lunch, as well as an assortment of snacks and beverages including beer and wine. Ice cream cones and shaved ice with flavor bursts are a favorite treat for the younger set. For some sun-free afternoon fun, guests can play a round or two of mini-golf at the resort’s miniature golf course. Additionally, you can find plenty of other fun things to do in Glenwood Springs in addition to the natural mineral hot springs Colorado has! 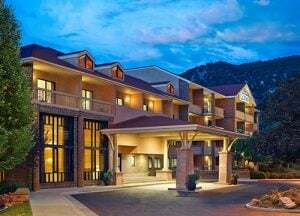 Stay just steps from the Glenwood Hot Springs Pool at the Glenwood Hot Springs Resort! Save 15% on lodging if you book from October 1st, 2018 to November 30th. *Blackout dates apply November 23-24th!